'Encyclopaedia Britannica' — one of the most trusted sources of information in the world, chose as a scientific editor of its 18-volume edition in Bulgarian Professor Zlatozar Boev from the National Museum of Natural History. 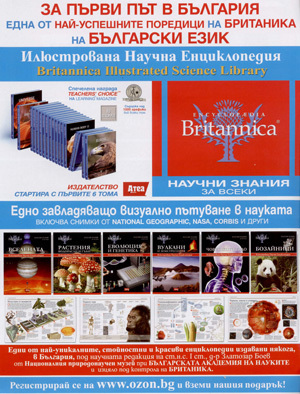 The Bulgarian edition of 'Britannica Illustrated Science Library' is done by Atea Books. In 2010 it issued the first 3 volumes — 'Universe', 'Plants, Algae, and Fungi' and 'Evolution and Genetics'. Each volume contains 94 pages filled with accurate and understandable text and hundreds of magnificent illustrations. Zlatozar Boev is author/co-author of 12 popular science books and 15 textbooks, 290 popular and 260 scientific papers, published in 17 countries in Europe, Asia and North America. He edited the translation of 34 and translated in Bulgarian 22 popular science books on natural science topics. He is member of 8 international scientific organisations, the Bulgarian Translators' Union, Union of Scientists in Bulgaria and others. His main scientific contributions are in the field of palaeornithology, mainly the fossil birds from the Neogene and Quaternary of Bulgaria. At the National Museum of Natural History he is a head of one of the largest departments — that of 'Vertebrates'.